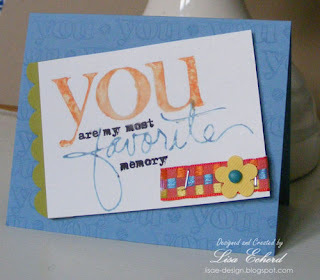 One tip in our lessons from Stretch Your Stamps at Onlinecardclasses.com is to use your sentiment stamps as backgrounds. Repeat the image and you get an interesting background. I stamped "you" and a circle image repeatedly in Versamark on my little card to compliment the larger "You" in the sentiment. I was also trying out Shari Carroll's water technique for the larger "You." There are so many little tips in this amazing class! All the images here are from Ali Edwards for Technique Tuesday. 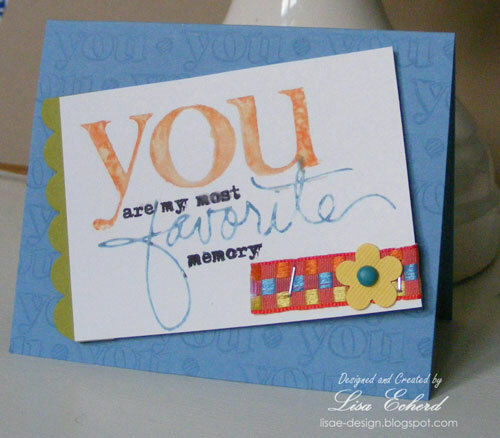 I think this little card would make a good enclosure the next time I give a memory book gift. Thanks for visiting! I have several projects lined up for the coming week so I hope you'll stop by again. Love this idea, Lisa... and love the card! This would be the perfect card for that special someone to let them know how important they are too! Love this card and your techniques!